Cathedral School Grounds, Bangalore, India. 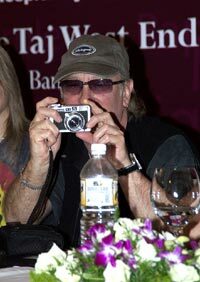 Well, I finally got to see Deep Purple in India. Although I've seen Deep Purple several times in the US, beginning in 1996 in support of 'Purpendicular', I've always wanted to see them in my home country. Since relocating to the US, I'd missed the band in 1995 in Mumbai and Delhi, and subsequently in Bangalore and Goa in different years. I've been spending a lot of time in India since 2004, and I was looking forward to a date in India. When I saw that a Bangalore data had been announced for Dec 17th 2006, it was a very pleasant surprise. The event caused quite a stir there, with several banners appearing around the city, as well as posters stuck on city buses. A chance meeting with the General Manager of the West End Hotel in Bangalore (where the band stayed during this visit) led to my being roped in to help with the band's arrangements in Bangalore - this was described in The Times Of India online edition. Q1: Will the band use Bradford for their next album? Little Ian's answer was that it depended on schedules, since Bradford had other clients as well, so nothing can be said now. After which Don related the "Moreblack" incident involving Bradford filling in for Steve, which produced a big laugh. Q2: Can we expect the next Dixie Dregs album anytime soon? (Full Circle came out in 1994), so it is time!). Steve's answer was that it took a lot of effort to do an album, which involved time away from family and kids, so things had to be balanced - I think the answer was not any time soon. At the end I managed to play the fawning fan and got a number of autographs, although the rush to the stage was huge, and I couldn't get as many autographs as I would have liked. Later in the evening, I saw Roger, Little Ian and Steve at the bar, but they were having a great time with the bunch that they were with, so I didn't interrupt them, much as I wanted to. I did play DJ while they were there, and got to play some tunes off ''Snapshot', 'Live At The Olympia', and a few tunes from the 'In Concert with the LSO'. I consciously did NOT want to play Smoke On The Water, Highway Star or one of the hits. On to Sunday, the day of the concert - the show was to start at 7:00 PM at an open air venue, the grounds of Cathedral School. I reached the venue at 3:35 PM, only to find about 20 people already in the line. Most of the people were youngsters - teenagers and people who looked to be in their early twenties, with only a couple of oldies like me. By the times gates opened at 5:00 PM, the crowd before me swelled to about 75, with people joining their friends in line. My 15-year old nephew was with me, keen to attend his first Deep Purple concert. I managed to get to third row from stage, right in front of Steve's Engl stack. I couldn't really estimate the size of the crowd, but I thought I heard that it was around 10,000 people. Promptly at 7:00 PM, a local band 'Galeej Guru' started an energetic set that included a mix of covers and some original tunes. While they were good, I was glad when they ended their set at 7:30 PM. A little past 8:00 PM, the lights dimmed, and the Purple guys strode on stage. Little Ian started the proceedings. The set list was: Pictures of Home / Things I Never Said (now why did they leave this gem from the album again?) / Into The Fire / Strange Kind of Woman / Rapture of the Deep / Fireball / Wrong Man / Contact Lost / Steve solo (including 'Back in Black', "Sweet Child of Mine' among others) ~ Well Dressed Guitar / When a Blind Man Cries / Lazy / Don Solo ~ Perfect Strangers / Space Truckin' / Highway Star / Smoke on the Water. Encores: Hush / Roger solo ~ Black Night. Pretty much the same as the tour so far, except that they left out 'Kiss Tomorrow Goodbye'. The show was absolutely amazing - one of the best I have seen from the band. I do believe that they were surprised at the energy in the crowd, and they fed off of it, delivering a blistering performance. I thought that the three Rapture Of The Deep songs fitted in well in the set, particularly Wrong Man. Steve's solo pieces, from Contact Lost to Well Dressed Guitar went down really well with the crowd - I saw many, many folks shaking their heads in disbelief during his solo. Ian was in fine voice, and interacted frequently with the crowd. He was clearly having a wonderful time, as were the rest of the band, who wore permanent grins on their faces almost throughout the show. The crowd sing-along during Roger's solo, introducing Black Night, was terrific, as was the mandatory sing-along during Smoke On The Water. The show ended much too soon - I would have loved to go back to the hotel to try and meet the band at the bar, but I had to play responsible Uncle to my nephew after his first Deep Purple show (who had a rocking time), and drop him home. Since the organizers did not allow cameras to the venue, I couldn't get pictures of the show, but a friend I made at the press conference, Girish Menon - a fine concert photographer - took some outstanding pictures during the show, whose link appears at the end of this review. All in all, the band conquered Bangalore, clearly showing why they are billed as the 'Gods of Rock'. Thank you, guys!